November and December . . . a time for celebrations and food! As residents of Sunnyvale, we have long enjoyed an abundance of well-stocked grocery stores in which to shop for our holiday foods. Some of those markets have disappeared through the years, almost forgotten, falling prey to shifts in population and changing food needs. One such “long ago” grocery store was Sunnyvale’s Co-op Market. In 2002, my husband and I made the decision to join the 24 Hour Fitness Gym on Fremont Avenue near Saratoga Sunnyvale Road. When we applied for membership, the buff, tank-top attired young man who took our application asked if we had been to the gym before. “Not to the gym”, I answered, “but I did buy our lettuce and milk right here!” I went on to explain that the large building which housed the gym was once the home of the Co-op Market. 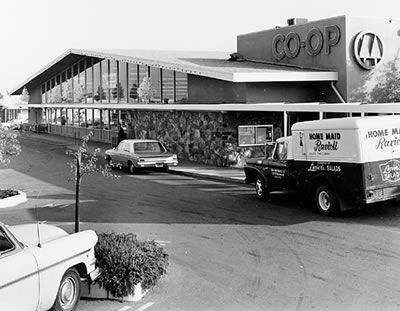 Sunnyvale’s Co-op was one of six Co-op (Consumers’ Co-operative Society) markets located in several mid-peninsula locations, including Palo Alto and Mountain View. Although Sunnyvale’s Co-op did not open its doors until 1959, the Co-op concept began in Palo Alto in 1935, during the Depression years, with the objective of creating a customer owned co-operative food-buying club. At the peak of their popularity in the 1960s and 1970s, the Co-op stores, known for “thinking outside the box”, were among the first markets to carry organic produce and bulk food items. When we moved to our present Sunnyvale home in 1972, the nearby Co-op, where regular customers were greeted by name, became a routine stop on my weekly grocery trek. Providing service to its shoppers and to the community was an important mission of the Co-op markets. One such service was the Kiddie Korral. While moms and dads shopped for groceries, their little ones were cared for and entertained in a large-windowed room at the front of the store. The Kiddie Korral was filled with a variety of books, puzzles and toys, including my children’s particular favorite, a sand table on legs, where they could run little toys through the sand and dig to their hearts’ content. Another useful Co-op service was a community bulletin board, located at the store’s entrance. Covered with flyers and notices of items for sale, properties lost, babysitters needed, and notification of everything from garage sales to school carnivals, the store was a type of community center, giving the neighborhood a pleasant, small town feel. The Sunnyvale Co-op closed its doors in 1982. The stores in Mountain View and Palo Alto’s Middlefield Road location continued in business until 1986 and 2001, respectively, when competition and changing consumer habits deemed the stores impractical. Although the building which housed the old Sunnyvale Co-op is now a gym, Sunnyvale “old-timers” still remember the friendly employees, displays of “unique-to-the-times” food items, a well-posted and informative community bulletin board, and the Kiddie Korral where happy children played while grateful parents shopped for their holiday tables. This entry was posted in Blog on November 7, 2017 by Margarete Minar.